In the market to buy a new BBQ? For smoked food lovers, the best smoker barbecue will go down a treat come summer time parties. If you're one of those people who simply can’t pass up a delicate sliver of gravlax or a plate of devilishly sticky American-style ribs, why not make like Hugh Fearnley-Whittingstall, Jimmy Doherty and legions of other artisanal food fanatics and give home smoking a go? It’s easier than you might think with the right kit, and we’ve rounded up the best smoker barbecues to make it even easier. For more of the best barbecue recommendations read our guide, otherwise browse these helpful tips on how to barbecue right, to get the best results. WHAT IS THE BEST SMOKER BARBECUE? The all-round best, according to smoking aficionados, is the Weber Smokey Mountain Cooker. Testers found that it was efficient, stable, and easy to use, making it ideal for both beginners and serious hobbyists, but if you’ve got your eye on something a little different, keep reading below. The most important distinction to make is that all of our chosen models are hot smokers, which cook food low and slow for melt-in-the-mouth tenderness, although you’ll occasionally find a model, like the Bradley 6 Rack Digital Smoker, that’s compatible with a cold-smoker attachment. We've included a range of charcoal, electric and gas smoker barbecues on our list to ensure there's something to suit everyone's needs. Smoker barbecues can be made from all sorts of materials, but for durability be sure to look for one made from steel, porcelain or glass. A key figure when it comes to transporting your smoker barbecue whether you want to pop it in a shed come winter or you like to move your garden furniture around every month, the products on our list range from 11-30kgs. -We can't think of any! Weber’s the big name in barbecuing, so it’s no surprise that they’ve successfully turned their hand to barbecue smokers too. The appropriately named Smokey Mountain Cooker is, as you’d reasonably expect, on the pricier end of things. 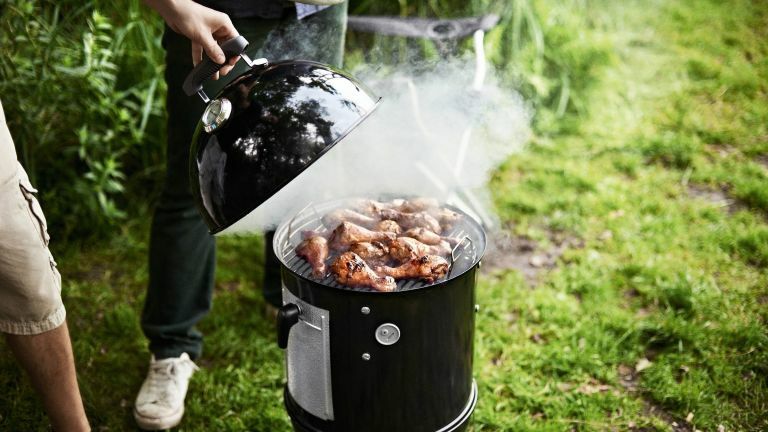 However, reviewers – award-winning competitive smokers among them – agree it’s the best of the best, loving its ample water pan and saying it’s quick to heat and holds an even temperature. This creates the ideal combination for successfully slow-cooking tough cuts of meat. Multiple vents are a nice touch too, letting you compensate for the inevitable high winds of the British 'summer'. We think it's the best smoker barbecue you can buy. If you’re looking for a smoker that you can leave to its own devices while you kick back with a cold one, the Bradley Digital 6-Rack Smoker is the best smoker barbecue for you. Ideal for big gatherings and batch cooking, it has six generous racks equating to the capacity for around 50 pounds of meat or fish, and reviewers found it superbly simple to set up and use. The clear digital display gives you control over the process, including the exact cabinet temperature, leaving things less to chance than with a more traditional smoker, and the automatic briquette delivery system means nothing will burn out, overheat, or otherwise affect those lovely cuts. It’s big, it’s easy, and like its NOLA namesake, it does a mean barbecue. If you can’t justify a standalone smoker, or just want a cooker that really earns its keep, this one’s a great option, because it grills and roasts too. Use it for steaks and burgers by flipping up the lid to get to the easy-clean porcelain grill, chuck a chook in the roaster for a mouth-watering twist on a Sunday classic, or pop some chips in the easy-access front-loading smoker and call on the included rib hooks to cook up the juiciest rack ever. Great for alfresco dinners, barbecues and all sorts of experimentation, this is our best smoker barbecue for versatility. If you like the look of Landmann’s traditional-style offset side box smoker above, but can’t find the wiggle room in the barbecue budget, this is the best smoker barbecue for you. While it might not boast some of the finer design details, it still looks great, and reviewers found it did the job when it came to melt-in-the-mouth slow-cooked meat. Some serious smokers commented that hitting the perfect temperature could be a struggle, however if it’s a mild smokey flavour you’re after, they noted that it should be ample. A good budget option. Another Landmann option, this time powered by gas rather than charcoal, the Tennessee is a neat and compact smoker cabinet with barbecue capabilities and a charming retro look. The large smoker cabinet leaves lots of room for chunkier cuts, while the adjustable cooking height and additional hooks are there to handle anything you can throw at them including fish and vegetables, giving you the option to cook a whole meal in a single gadget. Impressive! The separate wood chip and water drawers and ventilation discs for variable air flow make setting up simple, making it the best smoker barbecue for beginners as well as those after a gas model.